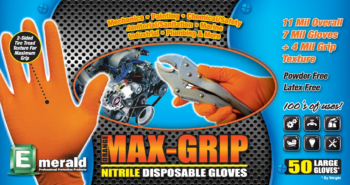 The Emerald Orange Max-Grip powder-free nitrile glove offers an innovative design giving tenacious grip with superior tactile feel. This latex-free 7 mil disposable glove has a beaded cuff and a 4 mil textured ridge to channel fluids away when gripping wet surfaces. 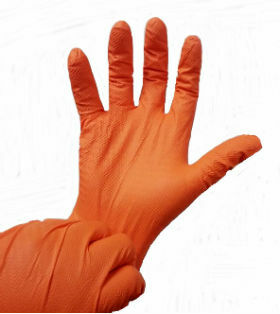 The vibrant orange color makes this the ideal glove for PPE applications requiring high-vis clothing. Perfect for mechanics or anyone needing protection and security handling slick equipment. 50 gloves per dispenser box, 10 boxes per case.